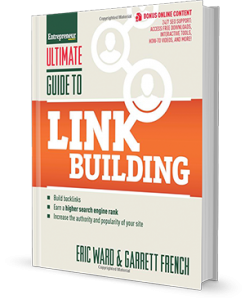 In 2013 Eric authored “The Ultimate Guide To Link Building” for Entrepreneur Press. Content linking strategist Eric Ward founded the Web’s first service to help publicize web content to the online world back in 1994. Then lightning struck when Jeff Bezos asked Eric to announce and publicize Amazon.com’s debut. Eric subsequently won the 1995 Tenagra Award For Internet Marketing Excellence, which was the web industry’s “Oscar” back then. Eric creates and has executed content linking and publicity campaigns and strategies for PBS.org, WarnerBros, Discovery Channel, National Geographic, The New York Times, TVGuide.com, Paramount, and Weather.com. Eric’s methods continue to be featured in numerous publications, interviews, podcasts, as well as included in college courses. Eric has presented at over 160 industry conferences, symposiums and trade events. In 2015, Eric contributed to the book Success Secrets of the Online Marketing Superstars, by Mitch Meyerson, and in 2013 Eric authored the book The Ultimate Guide to Link Building for Entrepreneur Press. Going back further, in 2008 Eric was one of 25 people profiled in Online Marketing Heroes, from Wiley & Sons, Inc., by Michael Miller, and in 2000 he contributed to the book E-Volve-or-Die.com: Thriving in the Internet Age Through E-Commerce Management by Mitchell Levy. Back in the Dark Ages (1997) Eric was named one of the Web’s 100 most influential people by Websight magazine. Of course, in 1997 there were only 104 people on the Web, but Eric was still honored. First, he publishes LinkMoses Private. 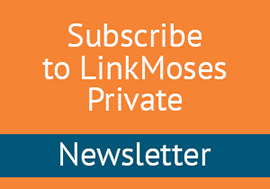 LinkMoses Private is a linking strategies newsletter sent every month to private subscribers. The newsletter contains high quality Publicity and Linking Opportunity Alerts (PLA’s), linking strategies, tactics and examples based on his client work over the past two decades. Second, Eric continues to offer live linking strategy sessions, link building training, workshops, strategies and M/A counsel. He maintains a growing library of 300+ public/free strategic link building articles, webcasts, and presentations. His old blog was titled Link Building Best Practices. Eric still occasionally contributes to the LinkWeek column for search industry news site SearchEngineLand.com and SearchEngineWatch. Over the years Eric has written for Web Marketing Today, ClickZ, MarketingProfs, and print magazines Search Marketing Standard and Ad Age. Eric, his wife and three children live in the shadow of the Great Smoky Mountains in Eastern Tennessee. Eric works alone by design and prefers to take a hands-on approach with his clients. You can learn more about his services here. Before the first graphical Web browser was invented, I spent my twenties working for print and broadcast companies in marketing, advertising, and public relations. I even sold Yellow Page advertising. To say I did not enjoy it would be an understatement. Then I was blessed to land a job as a Marketing Director for Whittle Communications, where I worked on a TV/Magazine property called Special Reports, which was hosted by Good Morning America’s Joan Lunden. Whittle Communications was one of America’s top 100 media companies in the early 1990s. I thought I was hot stuff. I flew on four flights a week, every week, year round. I remember once having meetings in Dallas, New Orleans, and Birmingham in person on the same day. But…Whittle Communications soon died its inevitable death, and it was then that I decided I had to change my life’s direction so I wouldn’t spend the rest of it on airplanes, selling advertising. In 1992, I started taking evening school Graduate courses at U.T. Knoxville, where I learned about the Internet for the first time. Back then the Internet was Gopher, WAIS, USENET, ListServs, and for the adventurous, Lynx. I was hooked. I’ve been online ever since, learning and absorbing everything I can. I transformed myself from gregarious but disinterested sales guy into introverted net-geek. I remember the day a grad student named Mark Andreesen distributed Mosaic 1.0, (Netscape’s Great Grandmother), and I was online the day Jerry Yang and David Filo first turned Yahoo loose. Akebono anyone? Back then Jerry helped me create a new Yahoo category for web promotion, because at the time there was nobody else doing web promotion. How scary is that? I emerged from my grad school period with an odd set of skills perfectly timed for the blossoming Web. A marketing and P.R. background and an obsessive desire to learn every nuance of a brand new medium. Then, through serendipity I joined The Internet Marketing Discussion List (a listserv), and I met Jeff Bezos, who called me (on an actual phone) told me he had this idea for an online bookstore, and he asked if I would help him promote its launch. I said yes. Today, as then, my area of greatest expertise is in helping new digital content to find its natural audience, and vice versa. My old NetPOST service (launched in 1994) was the Internet’s first Web site awareness building service, and I now work with sites of all sizes in the US and abroad. I still am invited to speak at several conferences each year, but for now I stay off the speaking circuit while raising my family. Here’s a session from one of my first conference gigs, way back in 1998. On the home front, my wife and I have three children and my hobby is building a replica of Mt. Everest out of broken toys.